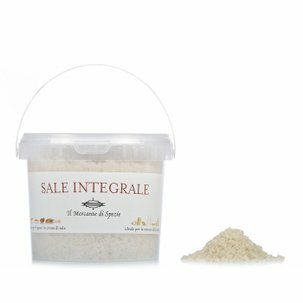 Fleur de sel is completely Italian and contains essential oils of lemonand mint, these are the secrets of the fresh Mediterranean aromas of this salt produced by Il Mercante di Spezie. The Fleur de sel salt comes from the salt pans of Trapani over which blow the winds that generate the crystallisation of the salt and where it is eventually collected by hand. Add Fleur de sel Lemon and Mint salt at the end of cooking to white meat and fish dishes and to other dishes when you want to add a touch of freshness. Ingredients Italian fleur de sel 97.7%, Lemon peel TF 1.3%, Mint TT 0.93%, Essential lemon oil 0.07% For more information on product labels, please contact our Customer Service department. The information on the labels of the products may vary for reasons beyond our control, therefore, there may be discrepancies between the information on the site and that on the products delivered. Please always check the information on the product before consumption or use.